Metabolic Surgery for T2DM is becoming more acceptable and was recently included as a treatment option in the ADA and EASD guidelines. Results in terms of weight reduction and improvement of diabetes are encouraging; however, safety concerns are still a major burden for endocrinologists when comparing it to drug therapy. The TANTALUS System provides a safe solution, which should be considered in patients where weight reduction is not the primary motivation for undergoing surgery. The TANTALUS System was implanted in more than 200 patients, and was proven to be safe and effective in T2DM obese patients. Here we report on the durability of the re-chargeable TANTALUS System implanted in T2DM patients. Since Jan 2007, 130 T2DM patients (61 F, mean HbA1c 8.2±0.1%, BMI 36.8±0.5kg/m²) were implanted worldwide, under several research protocols. All patients were followed for changes in weight, A1c and other metabolic parameters. Adverse events were reported and collected as required by the protocol guidelines. In general, studies have demonstrated a benefit of 0.6 to 1.0% (± 0.8 to 1.4) reduction in A1c at 6 months, with 2.6 to 5.6kg reduction in weight. To date, results are sustained in those patients where follow-up continues. Within the 4 years of follow up, there were no deaths or serious adverse events requiring device explantation or treatment cessation. Procedure related AEs were mainly anticipated events such as pain, discomfort, and pocket infection at the device implantation site, which were reported in 13 patients (10%). Those were mild or moderate and were considered to be part of the healing process, as they resolved within a short follow up duration. Device related events included sensation feeling during stimulation that was reported in 12 patients (9.2%). In 10 cases these events were resolved by simple reprogramming of the device parameters. In 2 patients these events required a simple surgical intervention to resolve the issue. 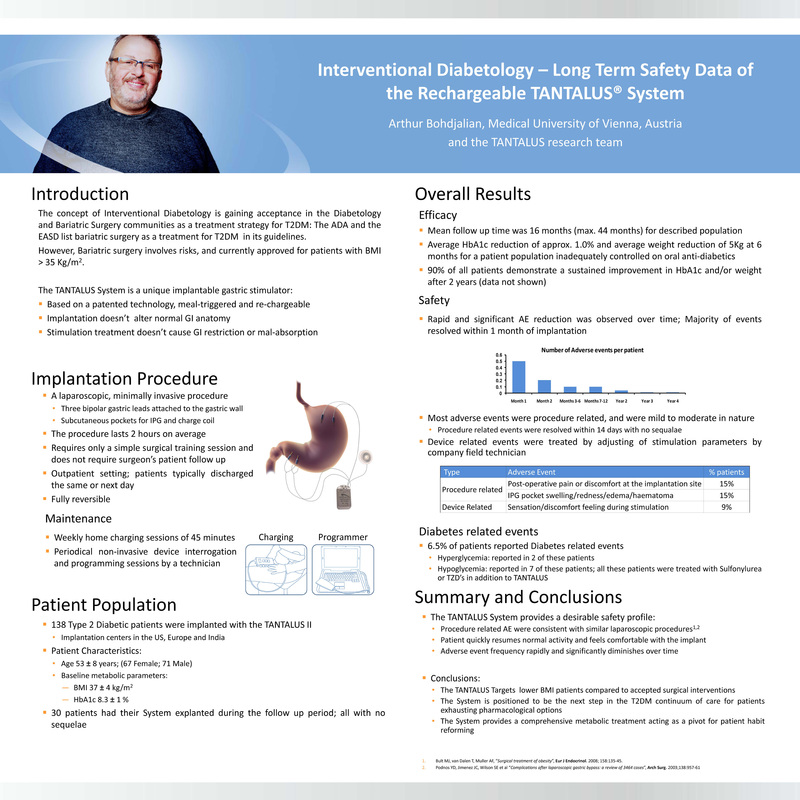 The safety profile in addition to its effectiveness makes a valid treatment option for patients failing on conservative treatment for T2DM of the TANTALUS System.